Jeep Wrangler (JK) (2007-2010); Black/Gray. 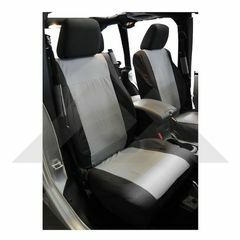 These durable polycanvas seat covers are custom made for a snug fit. The front seat covers have a built-in side air bag pocket for added safety. There are zippered mesh pockets on the front and sides of the seat for convenient storage. Large rear pockets offer additional storage. Custom fit headrest covers are included. Heavy duty straps and clips make installation easy. Available in Black/Gray only.